You can select Protune by going to the Settings menu (the wrench icon) either through the camera or the GoPro App. 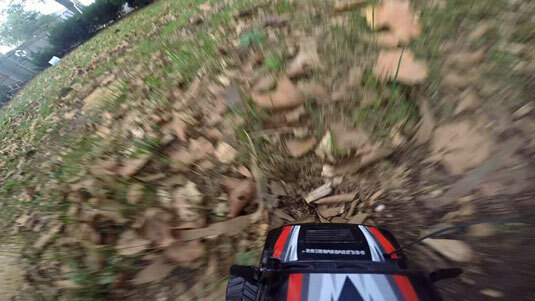 Protune consists of a group of features that let you fine-tune GoPro capture. Adjusting your Protune settings won’t affect non-Protune video modes. You can reset your Protune settings to their default states. 3000K: Comes close to the color temperature of indoor lighting. 5500K: Matches the color of daylight. 6500K: Matches the tone of an overcast day. Camera Raw: Doesn’t apply any white-balance setting, so it’s pretty much native out of the camera. Outdoor scene captured with the 3000K setting. Outdoor scene captured with the 5500K setting. Outdoor scene captured with the Camera Raw setting. This setting alters the sensitivity of the sensor. For shooting outdoors, you should set the camera to ISO 400, which allows you to adequately capture outdoor scenes with enough light. This setting also captures the scene with the least amount of noise. When you choose to shoot at dawn or dusk, however, or maybe indoors, you may not have enough light to render the scene properly. To capture a brighter image, you need to bump it up a little bit by increasing the sensitivity of the sensor, which you do by raising the ISO setting. The good news is that you can capture the scene with better exposure. The bad news is that the improved exposure comes at the expense of quality: You’ll have noise and grain in the image. It’s a good idea to keep the camera set at the default ISO 400 and make adjustments at those times when you need more light. That way, you can consistently produce clean video. 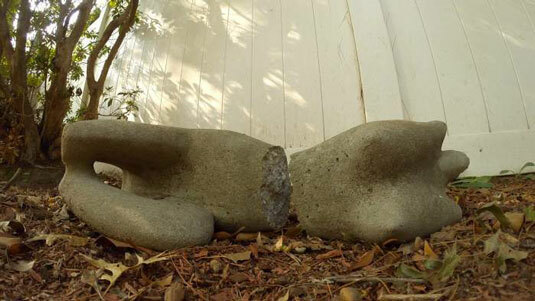 These figures show the extremities of this setting. Under normal lighting conditions at the ISO 400 setting, the scene reproduces with normal color, without much image noise or grain. Shooting the same scene with the ISO 6400 setting adds some noise while slightly mutating the color. 400: The default setting provides the best image quality in normal light conditions. When you use it in lower light levels, your video will be darker than normal. 1600: Ideal for moderately bright scenes, this setting produces slightly more image noise but is still within acceptable range. Make sure that you set it back to 400 when shooting in bright light. 6400: Use this setting to capture brighter video in low light (but with increased image noise). 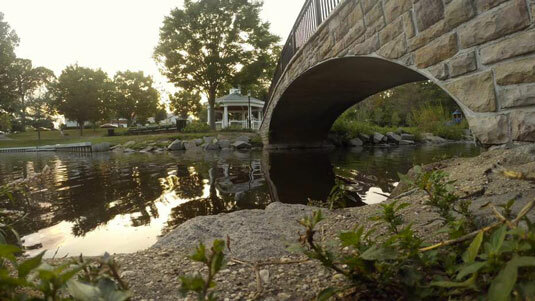 Like most digital cameras, the GoPro adds digital sharpness after capturing footage to give it the appearance of being sharper. By default, it applies high sharpness to the image, but you can change that setting in Protune to medium or low. The footage will definitely appear softer. You can always enhance it in postproduction, reminiscent of the Camera Raw setting on your DSLR (digital single lens reflex camera). Having control of the footage plays a big part in the look of your movie. You can adjust all these settings on the camera or in the GoPro App on your smartphone (see this figure). 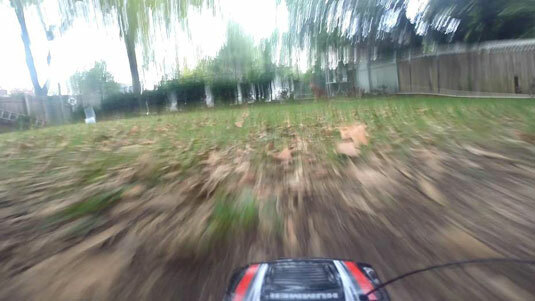 Protune lets you control image sharpness and can be accessed through the GoPro App on a smartphone. High: The default setting applies a great deal of sharpness to the scene. Sometimes it looks fake. 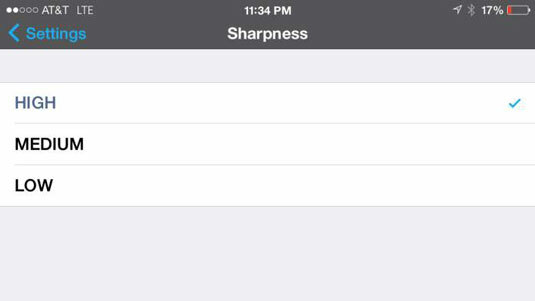 That’s because sharpness is added (along with other settings) while the image is being processed after you capture it. Medium: This setting is still pretty sharp but provides a bit more realistic appearance to some situations. Low: This setting captures video with the least amount of sharpness but provides the most flexibility in postproduction. If you change the setting to Flatter Color, you can do more in postproduction, especially when you’re looking to match footage. If not, the GoPro Color setting works pretty well. Exposure compensation provides a little more control by telling the camera to adjust exposure above or below the normal automatic exposure setting. These next figures show variations in exposure compensation. You can see how greatly they differ. You can adjust brightness only within the existing ISO limit. If brightness has already reached the ISO limit in a low-light environment, increasing it won’t have any effect. 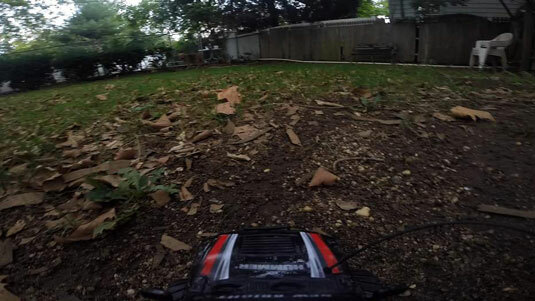 GoPro mounted to a radio-controlled car captured with normal exposure. Captured with the +2.0 exposure compensation setting, the scene appears to be very bright (in photography terms, overexposed). Captured with the –2.0 exposure compensation setting, the scene is darker than normal (underexposed). Protune gives you access to more resolutions and frame rates (see the table).